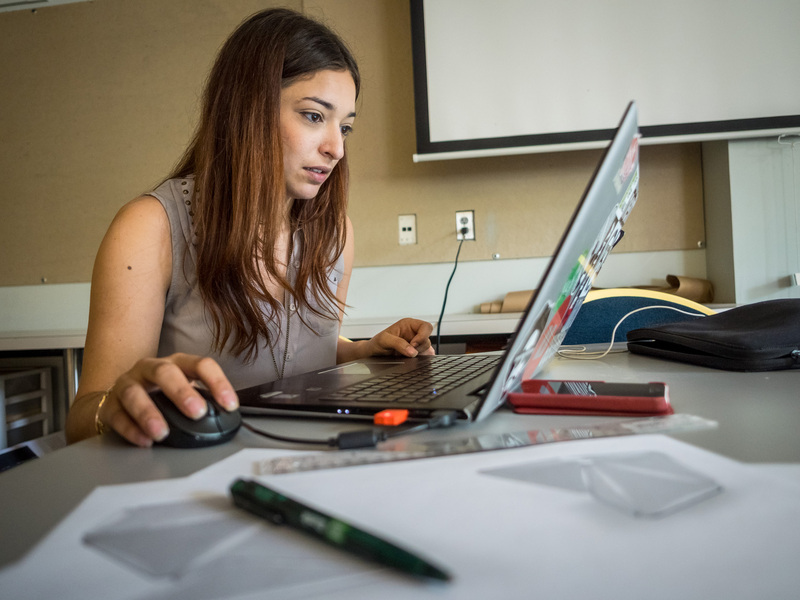 For Gabriela Veizaga, an industrial design major, inspiration for her senior thesis project struck at a Japanese restaurant. “They serve tea at the start of the meal, and I noticed that the teapot was cracked and stained,” she says. The Kawa was Veizaga’s Industrial Design program senior project and, together with the projects of other BFA candidates, was on display in the Kasser Theater lobby during May. For this yearlong project, the students were tasked with identifying a problem and devising a solution in the form of a product. The proposed ideas were pitched during the fall semester and concepts were developed and presented at the end of that term. In the spring, students began on their detailed design, reworking their concept and documenting everything about the project – how it helps, why it is feasible and sustainable, how to manufacture it, etc. Models were sketched, dimensions determined and prototypes built into the final products that were put on display. This past year’s products ran the gamut from Veizaga’s more efficient teapot to a self-driving car. 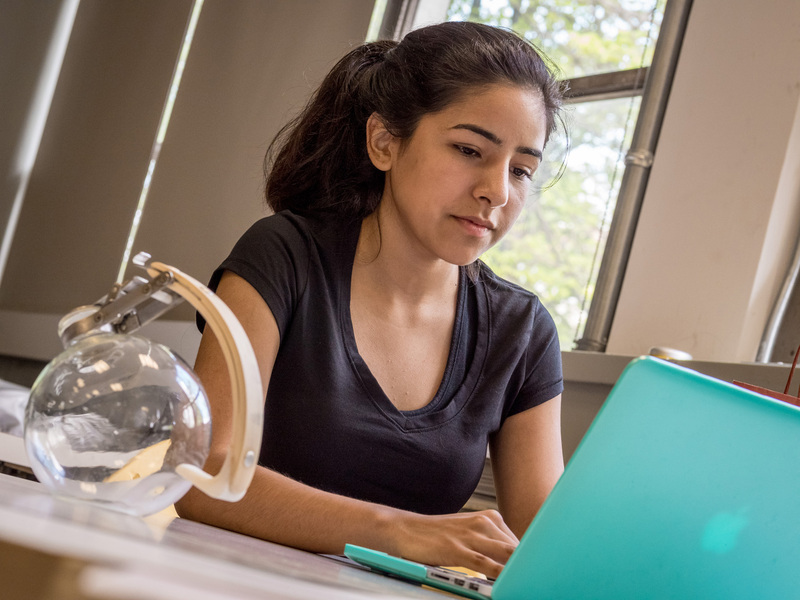 For each of the eight seniors, their personal interests influenced which problem they decided to solve, but their rigorous training determined how they would solve that problem. Arielle Cardone’s “Tringles” was inspired by the amount of time children now spend playing with gadgets. Tringles are triangle-shaped toys designed to lure children away from technology and engage them in imaginative play instead. While each thesis starts as an idea, making it into a reality requires some problem solving on the students’ parts. Just like professionals, they must research every aspect of their project, track down the necessary materials, and decide how to make them work for their purpose. 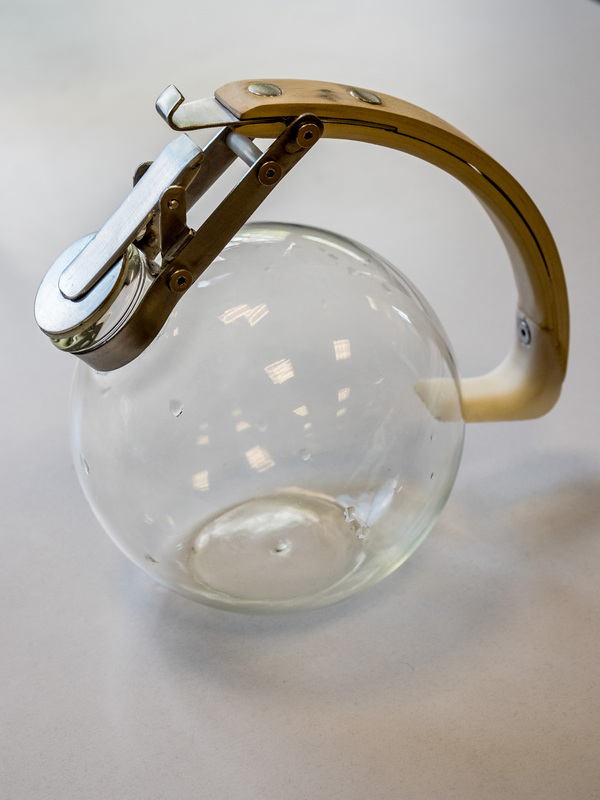 For her teapot prototype, Veizaga contacted a company that supplies laboratory beakers and requested one with the neck removed. 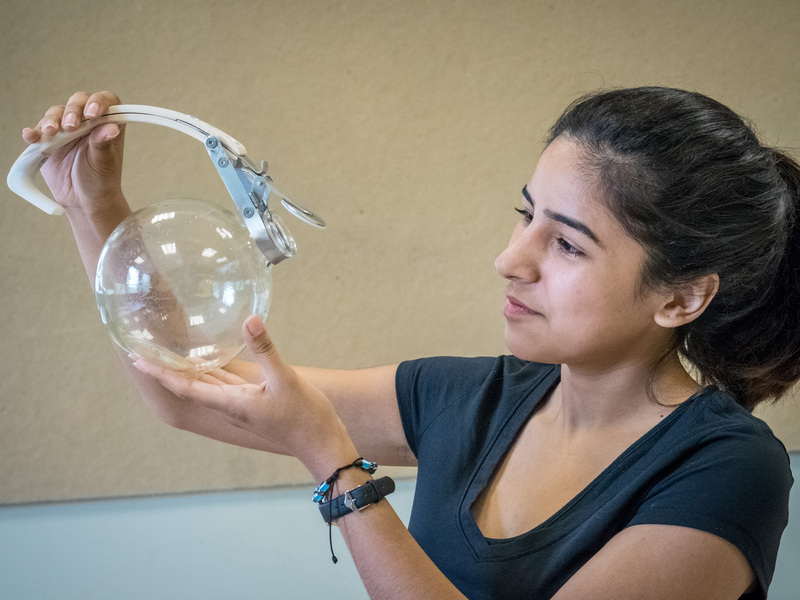 She also worked with a metal shop to manufacture the hardware, and used a 3-D printer to create a piece of the handle and the dome under the lid. As a result, the Kawa has a fittingly industrial appearance thanks to the combination of its glass pot (made from the same glass as a beaker so it can withstand the water temperature), sleek wooden handle and metal hardware. Its unique design makes it “a conversation piece,” says Veizaga. In addition to solving a problem, each new product must be designed with the user in mind. As part of her design process, Cardone hosted three separate focus groups at her house so she could observe how children in the Tringles target age range played with the toy. She set up a video camera to record the action while allowing the children to play undisturbed. Constructed with a solid foam frame and a breathable mesh center, each Tringle has magnets running down its outer edges that allow the sides to connect with other Tringles so children can build structures like forts and tunnels – or whatever else their imaginations conjure. And, as the magnets connect, those sides light up immediately. The toy was a hit with the children, and Cardone’s observations served as a guide as she honed her design. While the video footage confirmed she was on the right track with the overall concept and shape, it inspired her to make the pieces larger. 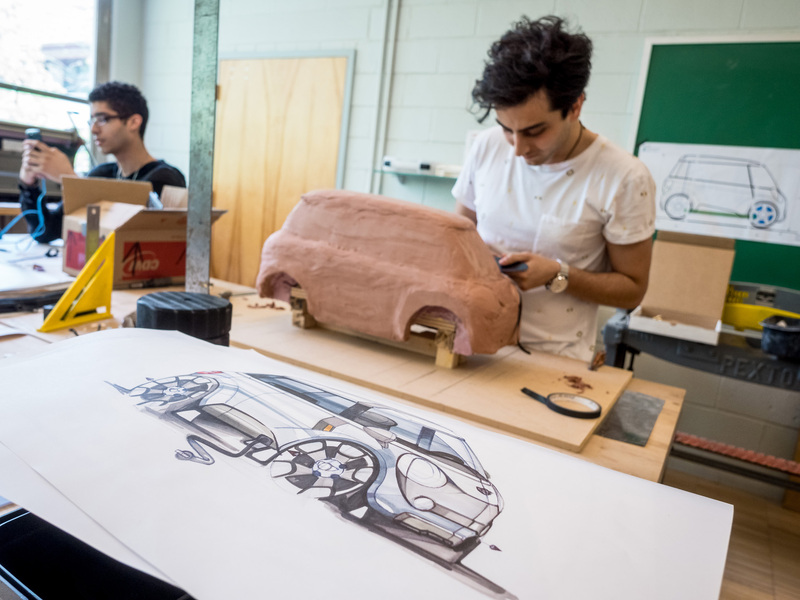 Aspiring auto designer Khashayar “Xerxes” Afshar also had the user in mind throughout his process. In fact, he set out to answer the question: “What would be the ideal urban car?” and let that goal be his guide. The result is a design for an autonomous electric car that is not only functional but also sleek and stylish – despite the latter not being a priority. 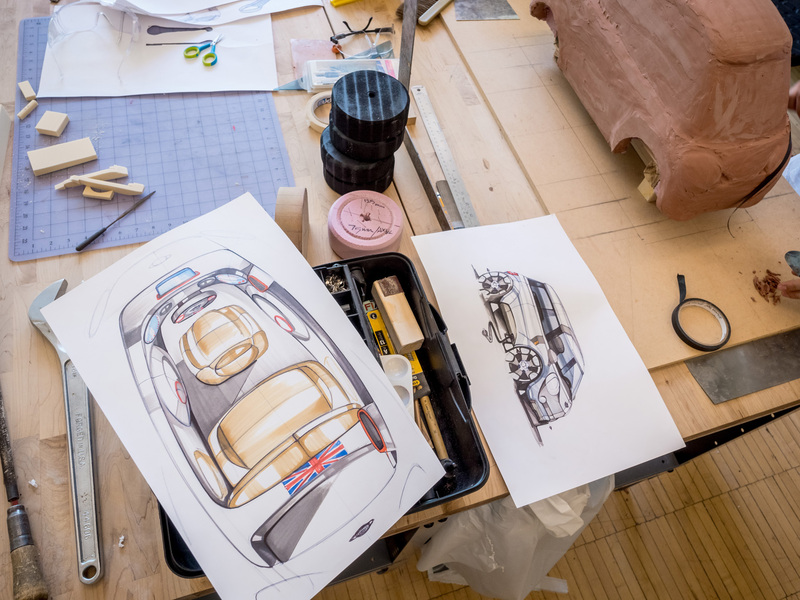 Tucked away in Finley Hall and accessed by a nondescript entrance located next to a set of garage doors, the industrial design studios are home to a rigorous program that demands complete dedication from its students. 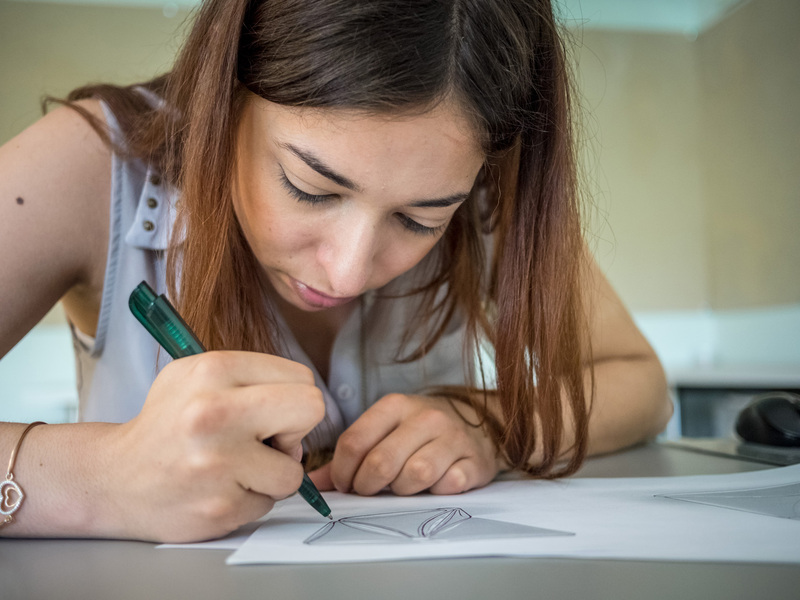 A portfolio is required for entry, and in order to graduate from the program students must complete seven credit hours of an internship. However, the rewards can be great. Program Director Denis Feigler says that over the past five years, everyone who graduated from the program landed a job in the design field. Graduates work in companies including Movado Group, Inc., Marchon Eyewear, Randa Luggage, Samsonite, Town and Country Living, Aqua Products, Ricardo Beverly Hills, MZ Wallace, Limited Brands – Victoria’s Secret and Toys R Us, to name a few. Internships are a key element to students’ success, as they help prepare them for working in the field. The program has partnered with the Movado Group, Inc., with several students completing internships there every semester over the past four years. Some have designed watches that are now available in stores, and in the last three years, five students have been hired full time after graduation. Students are also encouraged to study abroad. 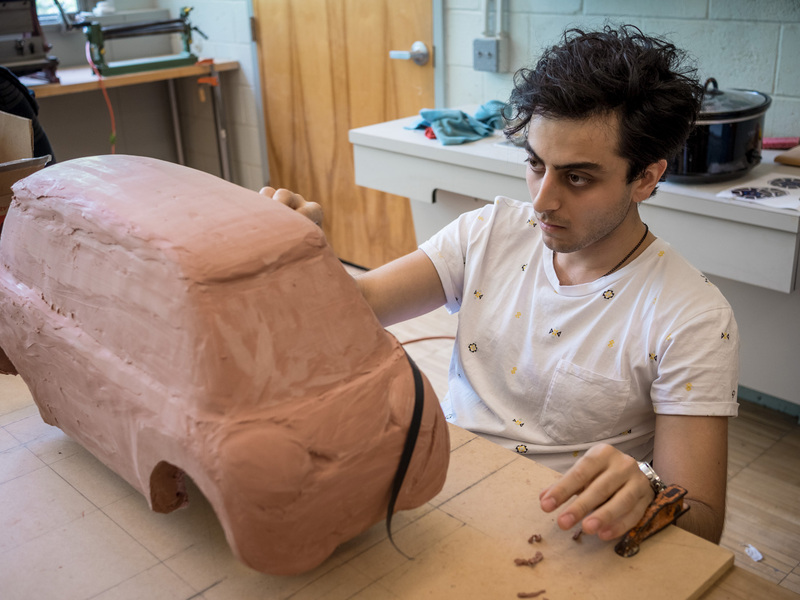 From this graduating class, Afshar spent a semester studying in the Transportation Design Program of Moholy-Nagy University in Budapest, Hungary, where he had the opportunity to work with Mercedes-Benz designing cars and developing conceptual ideas for future automobiles. 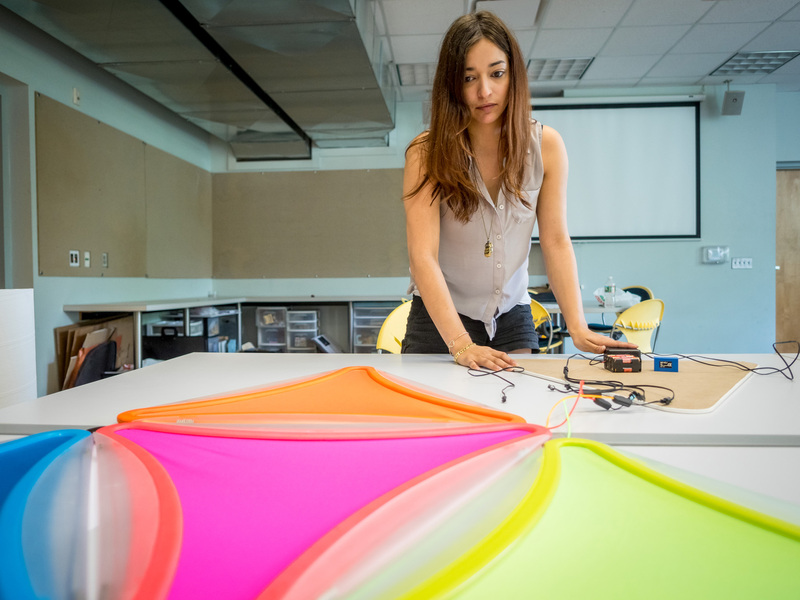 Despite its success, the industrial design program remains somewhat of a hidden gem at the University. Both Veizaga and Cardone describe entering the University undeclared and then “stumbling” upon the program. This is especially interesting since industrial design is a field in which women are doing well. “I think this program definitely prepares you for having a job in the field,” says Cardone. “Nothing is sugarcoated. The program is very demanding and time-consuming, but if you have the drive it is rewarding at the end.